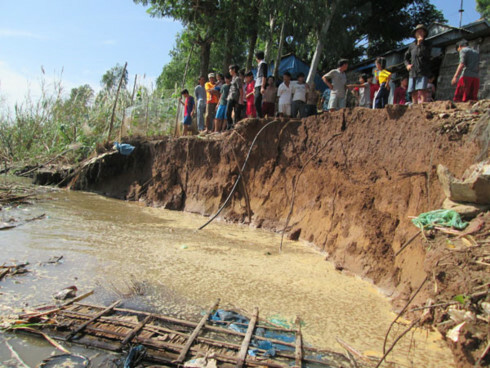 24 coastal areas in the Mekong Delta with a total length of 147 km have recorded landslide and soil erosion. Thousands of ha of land and protective forest have been washed away, threatening the livelihoods of tens of thousands of households. The government has funded localities to cope with landslides and soil erosion. Projects to upgrade sea dykes, adapt to climate change, and mobilize social resources have helped reinforce areas of landslide risks, plant mangrove forests, and resettle people to safe places. Since 2010 localities have strengthened 37 km of dike sections and planted 2,000 ha of forest. Climate change consequences, including sea water rise and severe landslides, have been seen in many coastal areas. Son Minh Thang, Deputy Head of the Southwestern Steering Committee, said it’s necessary to review the plan on climate change response, natural resources management, and capital mobilization. “We need appropriate mechanisms and policies for climate change response in the Mekong Delta. We have to revise the use of water resources, forest exploitation and plantation, and plans to mobilize investment for climate change response activities,” he said. The Minister of Agriculture and Rural Development has assigned its agencies to work with foreign experts from the Netherlands and Japan to study the Mekong Delta situation, focusing on landslides and measures to reinforce river and sea dikes.